Pressure cookers reduce the cooking time of food by building pressure inside the pot. As the pressure increases, steam is trapped inside and the boiling point of the liquid inside increases, cooking the foods at higher temperatures compared to stove-top cooking. Unless the cooker reaches the 15 psi needed for the high pressure of most recipes, the pressure cooker is no different than an ordinary cooking pot with a lid and cooking time does not decrease. Several things can prevent the cooker from reaching pressure, troubleshooting the problem and fixing it yourself can save you having to buy a replacement pressure cooker. Find out and fix why your cooker does not reach the needed pressure. This is the simplest problem to keep the pressure from rising in the cooker. 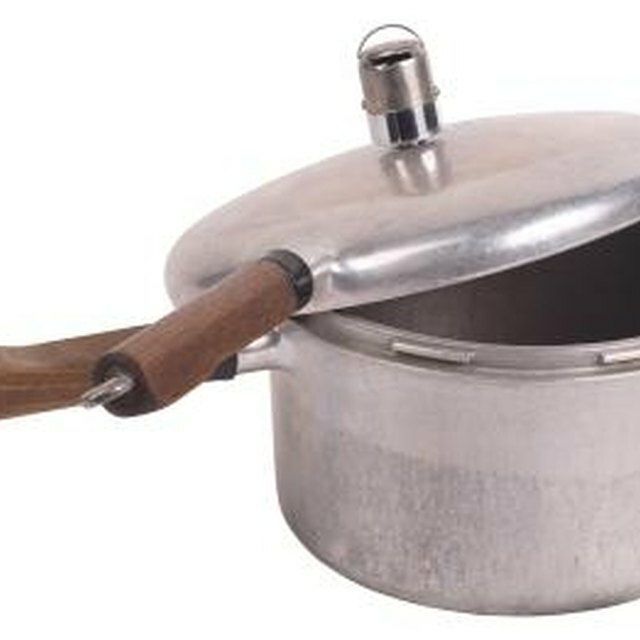 A pressure cooker will not increase the pressure without a tightly locked lid. This is a safety mechanism to prevent an unlocked lid from blowing off at pressure. Check the lid locking mechanism on your pressure cooker. Cookers usually require the lid to be rotated to lock, but some models feature an additional closure, which must be shut to properly seal the lid. Over time, the sealing gasket between the lid and the pressure cooker can become worn and frayed. This prevents it from tightly sealing the lid. If steam leaks out of the worn gasket, it keeps the pressure from rising inside the pressure cooker. Remove the gasket seal from under the lid and carefully inspect it for frayed, cracked or worn spots. If you notice any, replace the gasket with one designed for your pressure cooker model. Gaskets that are not worn might simply be set improperly in the channel around the lid. Remove the gasket from under the cover of the pressure cooker and replace it. Run your finger around the gasket to ensure it is properly seated in the lid without any parts raised above the the rest. Lightly coat the gasket with vegetable oil to help it seal more tightly on the cooker. Check the pressure regulator valve and the safety valve. The pressure regulator should be clean and free of debris. A clogged pressure regulator valve prevents the cooker from coming to pressure. Make it a habit to clean the valve every time you use the pressure cooker to prevent problems in the future. If your safety valve has engaged, you cannot repair the pressure cooker yourself and will need to replace it or call the manufacturer for repair. Pressure cookers often use a weight to regulate pressure that fits on top of the vent pipe. The pressure regulator weight must be in place to keep all the steam from escaping. Pressure cookers must be placed on a stove top over high heat. Using lower heat settings will dramatically slow the rate the cooker comes to pressure or prevent it entirely. Gas stoves immediately reach the set temperature, but electric burners require time for the coils to heat. Use two burners when cooking on electric or induction ranges. Set one to high heat and a second to low or medium heat to maintain pressure. Turn on both burners at once, and as soon as the cooker reaches pressure over high heat, move the cooker to the preheated burner at low or medium heat to maintain the pressure. Electric ranges cool slowly and the pressure can continue to rise in the cooker, potentially causing damage to the pressure cooker requiring manufacturer's repair or replacement of the unit. Pressure will not build in a pressure cooker without steam. Converting a recipe to a pressure cooker and not making adjustments in the liquid amount can prevent steam from being created. Always add at least 1 cup of water to the food in a pressure cooker. This provides the cooker with enough water to generate the steam it needs to create the pressure for cooking. Recipes using a high proportion of water to food take longer to heat the water and turn it to steam; consequently, they take longer to reach pressure than recipes using less water. Check the amount of food in the pressure cooker. Too much keeps it from coming to pressure. The level of food and water should be no higher than the "fill" line marked inside. Cook the food in batches or use a second pressure cooker if you need to prepare a large amount of food.